Hey y’all, Agent Martineau here. November Hot off back to back wins, I came gunning for the first ever three time win in the Fantasy Comic League. Sadly, things did not work out in my favour and I found myself in last place, with an incredibly poor showing of only 35 points. Agent Brat broke out of his last place stride, with 43 points, thanks to a strong showing from Jean Grey, who had a monumental issue with Jean Grey #10. Agent Hyrup put in a strong showing, with over a twenty point difference between herself and Agent Brat; her X-team scored her 64 points. 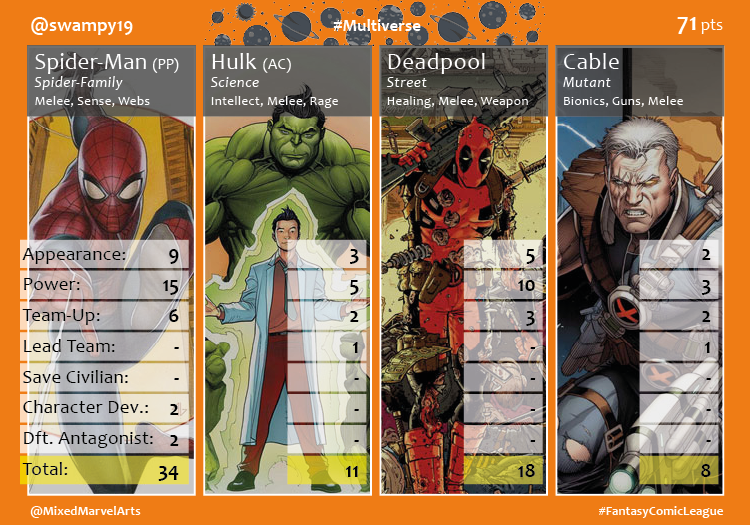 While Agent Swampy had a strong lead thanks to the combined might of Spider-Man & Deadpool, and won the month with 71 points, Agent Adam came damn close to taking it from him in the final week with 70 points; his team of youth heroes had no weak links, but could not defeat a 34 point Spider-Man. As we head into the final month of the 2017 year, things are incredibly tight in Multiverse; all bets are off as these five go head to head one last time before big changes in 2018. December 1, 2017 in Fantasy Comic League.